Still doing Angie’s October wardrobe edit and need help. 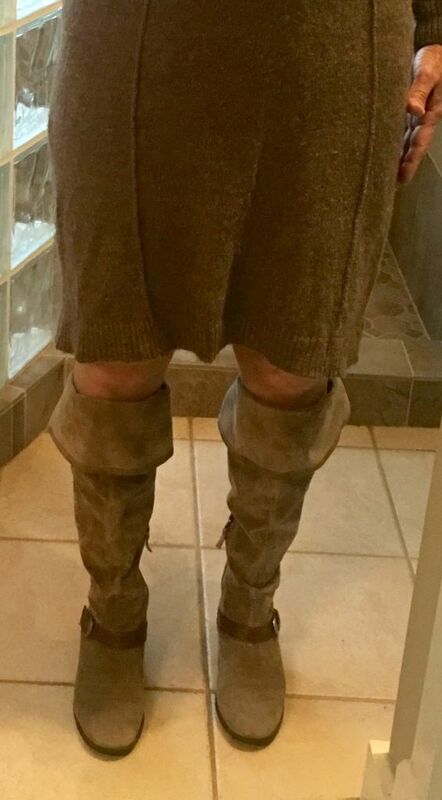 Please look at these OTK suede boots in photos 1-7. They are flat, comfortable with tights, and can be worn several ways. 1/2 OTK. 3/4 tops folded down. 5/6 one scrunched, one folded down inside. 7: both folded down inside. Please overlook bruised knee from a fall. The skin is healed but still looks discolored. The other photos are of some possible toppers for the sweater dress and dress alone. What looks best? Should I even be wearing the dress? Boots in these photos are shown folded down inside. I am eager to read your thoughts. Hi Joy . I prefer these boots ( which are lovely - great colour ) worn at full height . I’m ambivalent about the dress , in all honesty . You have such classically beautiful clothes that protect quality and sophistication , and something is missing here . Colour , or quality of knit maybe ? Sorry to hear about your fall and resulting injury - hope it doesn’t hurt too much . Lisa, thank you for your honest post. The dress is a lovely alpaca knit that needs some depilling. The taupe color is not quite as good on me as it once was (hair was a taupey gray for a few years). These are my lightest colored tall boots but maybe there needs to be more contrast. 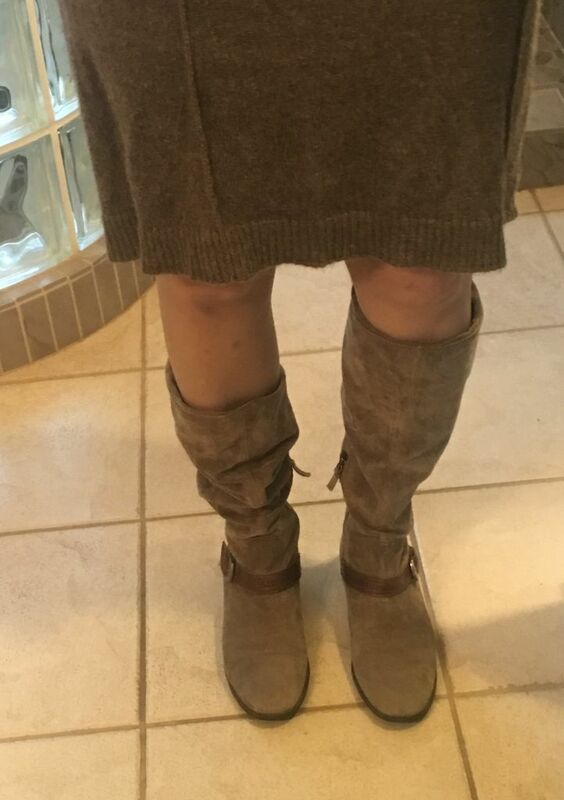 I love a tall boot with a dress or swishy pants, but my preference is for a lot of overlap- so much that even if you sit, nobody sees skin but only boot. That being said, the colors of the boots and dress are really harmonious and nice together. I love OTK boots and I love the colour of yours. I like with the dress where the boots are at full height especially - the column of colour effect. The alpaca wool sounds very soft and luxurious. I think the dress fits but is not really wowing me on for some reason though I love great wool knits. Maybe needs more structure even for a knit, hang better in the skirt, and maybe placket issues. Then while you really rock soft tonal looks, the overall effect of these combos is rather blah on you. Like too much softness. What other outfits would you create with the boots that might juxtapose some crispness and contrast? Joy, my vote is for the OTK boots. The alpaca must be sooo soft and comfortable! I prefer the sweater dress with the long sweater in #8, 9. I also like it with the vest and scarf. I like the long visual line those looks create. I like it with the vest and the sweater coat. But the boots seem loose on you, like theyre sagging on the leg which is bugging me. Do you have more fitted tall boots to try with it? Or have those taken in a bit? I prefer OTKs full length but do the walking test as the boots tend to catch the dress when you walk. I also prefer the boots full length, Joy. They look FABULOUS. I vote pass on the dress. It's a little snug and warped at the welt. Loving the dramatic faux fur topper. I like the boots and agree that full length looks best. I also would pass on the dress. It just doesn't seem to spark joy ;-). Agree with others...dress is just ok but boots are good! I don’t like them folded over, though. I’ve never been a fan of that style...too pirate-like to me. Another vote for full length boots and that you can do much better than the dress. It doesn’t have enough shape. The idea of the looks is lovely, though, as are the toppers. Thank you all for your help. As Angie says, the dress is now a bit snug and in need of blocking. As for the boot fit, they are a bit loose, but nearly all boots are far worse for fit. Suntiger, I have a pair of tall, but not OTK black leather boots and some dark brown suede knee high with better fit on the calf. I have a black wool midi dress that I will try to style with these boots as no skin will show. What Jane said, for me! The boots are really too awesome! :) They’re not done yet. I also like them at full length with dresses and skirts. I think they would look great with skinnies and a tunic “scrunched” or folded down . Joy, I am so sorry to hear about your fall! And how about your eyes? Are you all healed there? I love the boots but also vote pass on the dress. I prefer them full length vs. scrunched with dresses but can see how they could work scrunched with skinnies. It looks like the boots can stay and dress go. Suz, I fell trying to catch a 3-year old on a Strider bike ( little bike with no petals so they use their feet) going downhill toward a street. It does not hurt now, just looks bad. My eyes have a couple more months to heal but it looks like I will not need eye glasses. Night driving is still bad. Doctor says that can take months. Gail, amazing that you have the same boots. I started tucking the top section inside to help close the gap with my skinny legs. I have considered having the shaft shortened but if wearing them full length looks best, I can do that too.